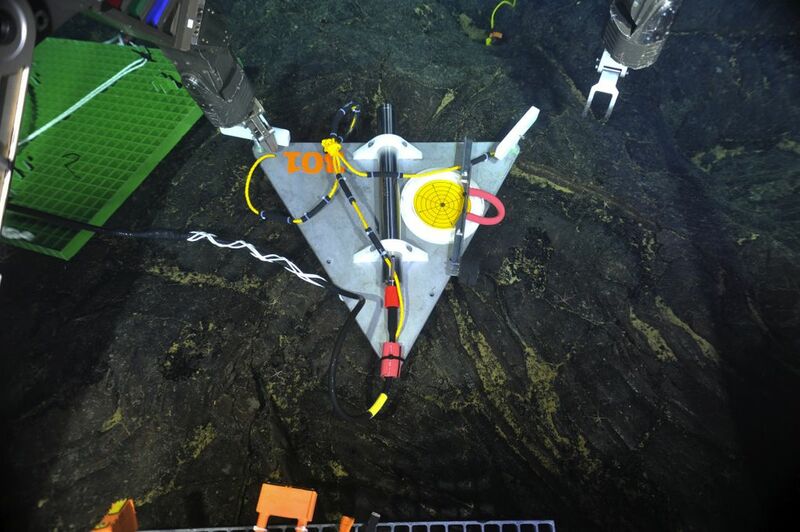 A new seafloor observatory operated by the University of Washington is providing unprecedented detail about the possible eruption of a submarine volcano off the Northwest coast. More than 80 scientists from around the world gathered in Seattle last week to discuss a thrilling development: For the first time, seafloor instruments were providing a real-time look at the most active, submarine volcano off the Northwest coast — and all signs indicated it might erupt soon. But even the researchers most closely monitoring Axial Seamount were stunned by what happened next. Beginning Thursday, April 23 — the day after the workshop ended — the new sensors recorded 8,000 small earthquakes in a 24-hour period. The volcano’s caldera, which had been swelling rapidly from an influx of magma, collapsed like a deflated balloon. Scientists are still debating whether to describe what transpired as an eruption, which means molten rock flowed onto the seafloor. No instruments were destroyed and there was no obvious temperature spike, so the magma might have oozed into subterranean fissures, forming what’s called a dike. The only way to find out for sure is to visit the site with a research vessel, which he and his colleagues will do this summer. But despite the ambiguity, the ability to monitor the submarine upheaval as it unfolded marks a major milestone for the United States’ first underwater observatory. Operated by the University of Washington and completed last fall, the $200 million network includes 600 miles of coaxial cable on the seafloor that powers and delivers data from scores of seismometers, tilt meters, microbial samplers and other instruments. UW oceanographer John Delaney first proposed the system nearly two decades ago, and is delighted to finally see the vision realized — and bearing scientific fruit. Delaney helped organize last week’s workshop for scientists interested in tapping the new source of data on Axial Seamount, and in discussing the current volcanic unrest. The seafloor network is part of the National Science Foundation’s Ocean Observatories Initiative. It’s designed to study everything from marine life to water chemistry and plate tectonics. Nearly 30 instruments are situated on or around Axial Seamount, because so much is going on there. “This is really the only observatory in the world on an active, underwater volcano,” said UW oceanographer Deborah Kelley. Topping out at about 3,000 feet high, Axial is more like Hawaii’s shield volcanoes than the Cascades’ towering cones. 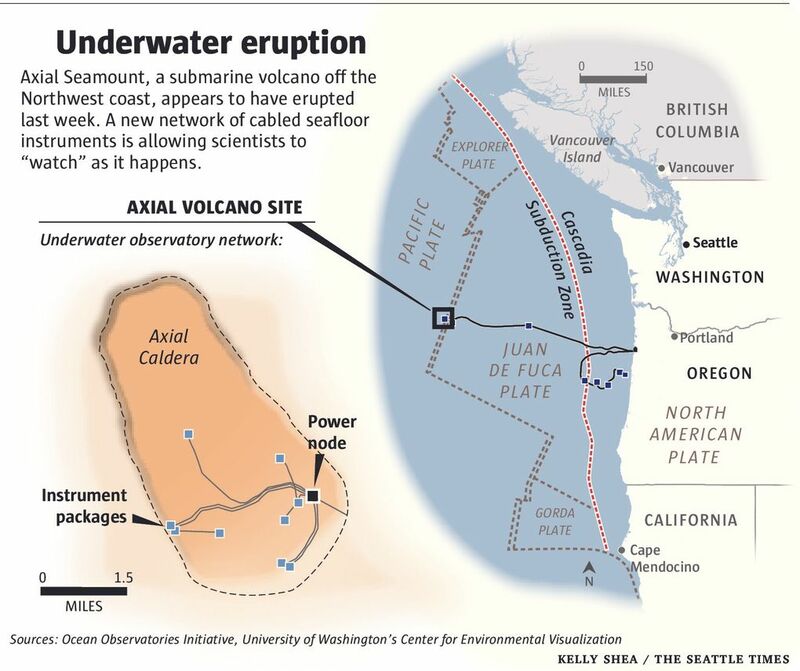 It straddles the Juan De Fuca Ridge — a seam in the ocean bottom where magma wells up and fresh seafloor is born. Most of the instruments are concentrated in the volcano’s central caldera, which is nearly 2 miles wide and 5 miles long. The caldera is also dotted with hydrothermal vents and fantastical chimneys called black smokers, which Kelley has studied for years, along with the communities of tube worms and heat-loving microbes that thrive in the inhospitable conditions. But Axial isn’t easy to get to. It lies under nearly a mile of water and sits almost 300 miles offshore. In the past, Kelley and other scientists had to rely on costly and sporadic research cruises to gather data and deploy temporary instruments. The last time the volcano erupted was in April 2011, but Chadwick and his colleagues didn’t realize it until several months later, when they retrieved battery-operated instruments deployed more than a year before. The first data from the seafloor seismometers started streaming live in December. It wasn’t long before the instruments detected a growing drumbeat of small quakes that seemed to signal magma was on the move. Pressure sensors and tilt meters picked up swelling at a rate four times faster than previously measured. Based on earlier observations made from ships, Chadwick had already taken the bold step of predicting the volcano would erupt sometime in 2015. The observatory data bolstered the argument, but even Chadwick had his doubts until Friday morning, when he and dozens of other scientists were glued to their computers, watching the seismometer readings pour in. Despite its early success, the underwater observatory has run into several snags as it gets up to speed. Cameras deployed last year failed. The Navy has occasionally restricted the flow of seismic signals, out of concern that scientists might be able to track submarine movements. Most significantly, the National Science Foundation and its contractors still have not developed all the software necessary to process and manage the growing stream of information. While seismometer readings are being streamed and are publicly accessible, data from the tilt meters and pressure sensors are only being released to a handful of researchers. Other instruments, like water chemistry and microbial sensors, still aren’t set up to distribute information. But none of the initial data will be lost. It’s all being temporarily stored at the UW, Delaney said. When they visit the volcano later this year, Chadwick and other researchers will use remotely operated vehicles and other instruments to scrutinize its northern flanks. Faint signals from some of the seismometers hint that lava may have broken through there. The researchers are also interested in the question of whether Axial is entering a more active phase. The 2011 eruption came after a 13-year quiet period, but the current activity started after only a four-year pause. Though underwater volcanoes pose no hazard to humans, insights gleaned from them might also be applied to volcanoes on land someday, particularly when it comes to the tricky question of predicting eruptions and issuing warnings that can disrupt lives and economies. Except for the possibility of wounded pride and failed hypotheses, testing prediction schemes on submarine volcanoes is relatively painless, Chadwick pointed out. “On the seafloor it’s easier to make wild statements because there’s pretty much no consequence to people,” he said.